The United States just became a safer place for our pets — or at least it will in time. This past December the Consumer Specialty Products Association and Humane Society Legislative Fund announced that antifreeze manufacturers throughout the United States have finally agreed to voluntarily add a bitter flavoring agent to their normally sweet-tasting products, rendering them less enticing to pets (and children). This voluntary measure will include all antifreeze and engine coolant products manufactured for sale in the consumer market in all 50 states and the District of Columbia. Antifreeze toxicity is a horrible thing to witness. Ingestion of even a small amount of ethylene glycol, the active ingredient in antifreeze, causes acute kidney failure in dogs and cats along with severe neurological disease. Symptoms often include lethargy, vomiting, diarrhea, loss of appetite, weakness, and ultimately coma and/or seizures. Unfortunately, even with aggressive and expensive therapy, most patients suffering from antifreeze toxicity don’t survive. The Humane Society Legislative Fundestimates that at least 10,000 animals are victims of this toxicity every year. Dogs are attracted to the sweet taste of antifreeze and will readily drink from a puddle that has leaked from a car’s undercarriage or has spilled from a container. Kitties are usually more discriminating when it comes to taste, but one who has stepped in antifreeze is likely to ingest some during the course of grooming. As little as a single teaspoon of the substance can be fatal for an average-sized cat. Prior to December, antifreeze manufacturers in 17 states were already required by state law to add a bittering agent to their products. The first state to enact this measure was Oregon in 1995. Since then, multiple attempts to make this a federal requirement have failed. Fortunately, antifreeze manufacturers have now voluntarily stepped up to the plate to do the right thing. The bittering agent, denatonium benzoate, is a nontoxic substance that is commonly used as a deterrent in harmful liquids and as a treatment for nail-biting prevention in humans. It is important to remember that the addition of a bittering agent does not render antifreeze products nontoxic for pets, although hopefully at least any pets exposed to it will consume less. There is also no way to determine whether or not the deterring agent has been added to any product that may already be in use in your neighbor’s car or in other vehicles. For both these reasons, continue to exercise extreme vigilance when it comes to potential exposure for your pets. 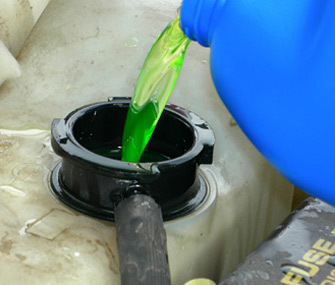 Safely discard any unused, unbittered antifreeze and replace with a bittered product, check under your car regularly for any leakage and make sure any antifreeze containers stored at home are inaccessible to your pets.